French Junior Minister for Budget, Jerome Cahuzac speaks during a press conference on tax evasion in Paris. 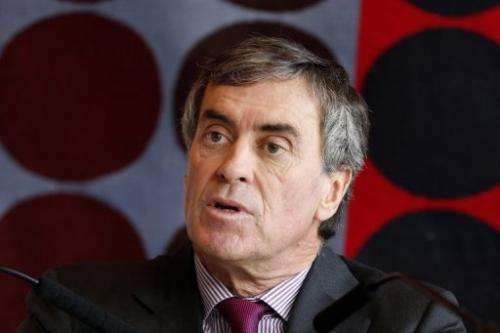 Cahuzac said Google would never win a court case contesting a huge tax bill claimed by French authorities. France's Budget Minister Jerome Cahuzac said on Tuesday Google would never win a court case contesting a huge tax bill claimed by French authorities. Cahuzac said he had "the most genuine conviction" that the courts would back France's claim against Google over unpaid taxes. Speaking to reporters in Nanterre near Paris, he said French authorities were in talks with Google and had provided the Internet giant with an estimate of the amount owed. Paris-based news weekly Le Canard Enchaine reported in its edition due to appear Wednesday that the tax bill stood at 1.7 billion euros ($2.17 billion), up from a previous estimate of a billion euros. Google reduces the amount of tax it pays in France by funnelling most revenue through a Dutch-registered intermediary and then to a Bermuda-registered holding, Google Ireland Limited, before reporting it in low-tax Ireland. France has also demanded $252 million in back taxes from online retailer Amazon, which uses a similar structure involving a Luxembourg-based holding company to reduce its exposure to French corporate tax. Google is also under pressure for alleged tax avoidance in Britain, where officials have said it paid only £3.4 million ($5.4 million, 4.2 million euros) in British corporate tax last year on revenues totalling about £2.5 billion. In an interview with the New York Times earlier this month, Google chairman Eric Schmidt said he hoped the firm would reach a settlement by the end of the year with authorities in France. I'm french and I wonder if Google is not much more usefull to me than the french government/state is.